Tuesday, June 12, 2012 at 8:00 p.m. The trio of Mats Gustafsson, Ingebrigt Håker Flaten, and Paal Nilssen-Love was established in February 2000 during a series of concerts and a recording in Stockholm. The recordings were released in Sweden by the label Crazy Wisdom/Universal. This trio is a long wanted collaboration where the German, British and American tradition of free music is melded together in this Swedish-Norwegian trio where the energy is at its peak. The repertoire is collected from the music of legendary trumpeter Don Cherry who spent many of his years living in Stockholm. These are tunes that are rarely played and represent a period in Cherry’s life that was to inspire the Swedish jazz scene. Cherry's son, Eagle Eye, wrote the liner notes for the CD (Gustafsson/Flaten/Nilssen-Love, "The Thing", Crazy Wisdom) that was released in Europe in Spring 2001. The trio toured Sweden and Norway in February 2001 with American multi-instrumentalist Joe McPhee who rarely appears in Scandinavia. 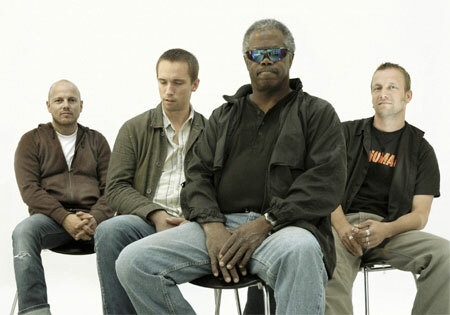 The band recorded their next CD with Joe McPhee which was released in August at Oslo Jazzfestival 2001. The repertoire consists of compositions by James Blood Ulmer, Frank Lowe, PJ Harvey, Sonic Youth, Yeah Yeah Yeahs, White Stripes and Joe McPhee. The Thing with Joe McPhee, "She Knows…" was released on Crazy Wisdom/Universal. Joe McPhee is a legend within modern jazz music. With many recordings on different labels with musicians from the world, he has established himself as a contemporary, improvising musician above all. Today he is active in several groups including Trio X and the Peter Brötzmann Chicago Tentet, where he first met Mats Gustafsson. Mats Gustafsson is currently Sweden's and perhaps Europe's most well-known artist within free improvised music. He has established himself as a saxophonist with a broad repertoire of extended techniques on level with Evan Parker and John Butcher. He has also been inspired by the "Brötzmann-school" which demands volume above all else. Mats is also known through AALY trio and collaborations with Jim O'Rourke, Thurston More, Jaap Blonk, Paul Lovens and Barry Guy among others. Since their first collaboration in 1992, Ingebrigt Håker Flaten and Paal Nilssen-Love have established themselves as Norway's heaviest rhythm-section through their work with the group Element. Today they are active in School Days with Ken Vandermark, the Scorch trio with Raoul Björkenheim, and Atomic.